Thank you for your professional performance and client-centered handling of the sale of our home on Moondance Street - before, during and after the sale. The professionally prepared periodic Wildwood newsletters led us to select you as our agent. We were not disappointed - we were delighted. Your attention to detail and professionalism impressed us throughout the entire process. Your advice regarding renovations and improvements to enhance the home´s saleability compared to those upgrades we had contemplated, saved us several thousand dollars. Your astute sense of the market value of the property, based on long-term marketing interest in the area led to a proposed selling price much higher than we had anticipated. My eyes noticeably may have widened at your suggested listing price. The marketing package you prepared, complete with detailed descriptions and floor plan, illustrated with color photographs, inside and out, was through and very attractive. To my recollection (I may be off by a few hours), the house was on the market less than a day. The house sold at the listed price you suggested - several thousand dollars more than we expected. Months after the sale was successfully completed, I asked you for some information to help prepare our income tax return for the year. Unsurprisingly, you responded promptly with a package of thoroughly documented information. That information led to a reduction in our taxes of several thousand dollars. Again, thanks for your client-centered approach and professionalism before, during and after the sale. It's been eleven days now that we have moved into our new home in Northern California and it is time to take a break from opening boxes and hanging pictures to write and tell you how much we appreciate all that you have done for us during the stressful time of putting our home in Thousand Oaks on the market and closing escrow in record time we are told!! You went beyond the "call of duty" and actually showed personal care, concern and friendship to Ralph and me at every step of the process. I do not know how we could have done this without you. You are truly precious and we cannot say enough "thank you" to express our gratitude. We hope for and wish you the best in your personal life and in your career because if anyone deserves it, you do!Looking forward to hearing your good news - always. P.S. - We will never hesitate to recommend you to friends when they need a realtor because you are the best! You two were absolutely wonderful! We really appreciate all the hard work you put in on the sale. Please feel free to use us as a reference. They can call us at home (805) 52x-xxxx. We wanted to thank you very much for helping find the most perfect house for us. We tried other realtors, but by the time they took us to look at a property, it was always sold. You, on the other hand, found properties the day they went on the market. You knew just the kind of house and the neighborhood we were looking for & notified us immediately when a house went on the market. It took just 3 houses to find the most perfect home for us. We also wanted to thank you for making the buying process so simple. You helped us find a great mortgage broker, you helped with the home inspection & you kept us informed every step of the way. You were always available day & night to answer any questions. We wish you continued success as a realtor. Thank you very much for a job well done. We reallly liked the way you handled the whole transaction. We are specially grateful to you for being so patient with these "first-time sellers," and always available where we needed you. Wildwood Elementary PTA would like to thank you for your generous support. Without support from the community and business, many programs and projects would not become a reality for our students. Thank you for supporting this years' spring fundraser. I would like to...thank you for the services you provided me in the recent sale of my Wildwood area home....As a real estate broker, I have been involved with many agents in the area. None have shown the professionalism that you exhibit. This is the second transaction I have been in as a buyer or seller where you were involved. In both transactions, you have been refreshingly straightforward...I would be happy to talk with anybody who would like to know more about you. 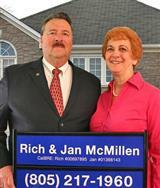 Thanks Rich for helping me sell my Wildflower home and selling us our new home here in Sunset Hills. I am very happy with all the work you did on my behalf. Your knowledge of financing certainly made this move up possible. My mother is looking forward to gardening in our new yard. Anyone using you as their realtor would be the better for it. How the heck are you. We are thrilled with our new home. Thank you again for all your help. We were very happy you were able to sell our Thousand Oaks home so fast. The fast sale allowed us to buy our new home here in Boulder. Donna and I would be honored to recommend you to any of your clients. Jesse and I thank you for all your hard work selling our home. It was hard to believe that it has been 16 years since you sold it to us. The hardest part of moving from the Thousand Oaks and Wildwood area is leaving such good friends like you. Your friendship over the years has meant a lot to us. Please keep in touch! I want to convey to you my sincere appreciation for your help purchasing my first home. Your professionalism and low-pressure approach actually made the home-buying process enjoyable for me. I also appreciate your patience with my hundreds of questions. I feel that I learned a great deal, in addition to securing an excellent home for myself. I feel totally confident in recommending your services to all of my friends and colleagues. I have told people of your integrity and willingness to go the extra mile, in addition to your low-pressure sales approach. I feel I will be doing a great service to anyone whom I can convince to use your services. Well now that the last box is unpacked and Larry is finally home from Korea, our lives have settled back down to a dull roar and we want to thank you again for all the help and hard work you did on our behalf. We really love this home and are so happy to be living here. The neighborhood is wonderful too and everyone has been so friendly and helpful. I hope business is booming for you. Thank you for all your help in selling my home here in Wildwood and helping me purchase my new townhome. I am looking forward to getting on with my life and I am very pleased with the condition the seller left my new home. I really appreciate your patience and guidance through our sale. Your positive attitude made all the difference in the world. I will be glad to tell everyone what a wonderful job you did. Thank you for your excellent service selling our home. Pat and I are pleased with your handling all the details during our long road trip. To complete the sale by radiophone from British Columbia was a particular challenge. You certainly earned your commission on this one. I will be glad to recommend you to anyone. Jerry and I want to thank you for all your kindness during the sale of our condo. You have a unique personal touch that helped make our move a pleasant experience. One of the nicest aspects of our sale was meeting you. As I told you previously, we especially appreciated your low-key approach. We will recommend you to anyone we know who is planning a move. I want to thank you for helping us with the sale of our Thousand Oaks home. We were very happy with your service and friendship. You did a great job with all the details. We love our new home and I am looking forward to the life of a retired person. We would be happy to recommend you to anyone. Thank you so much for the fantastic job you did selling our home. We were so pleasantly surprised that you were able to sell our house in just eight days and at the price we wanted. We will certainly recommend you to anyone. Wishing you the very best. Thank you for the wonderful job you did selling our home in Thousand Oaks. Pat and I appreciated your efforts to make our move as uncomplicated as possible. We were able to concentrate on moving and not on the details of our sale. I can't tell you how important that was to us. Dave and I are so happy with our new home. We can't thank you enough for all you did to make our dream home come true. Your calm and professional attitude throughout the sale process was wonderful. We will recommend you to all our friends. Again thank you!